With apologies to everyone who believes the Reds will contend next year, they won’t–it’s foolhardy to think otherwise. I know, I know: “stay optimistic”Ã‚Â and “anything can happen” and “baseball is a funny game” and “just look at the prospects!”Ã‚Â Look, I hear you. 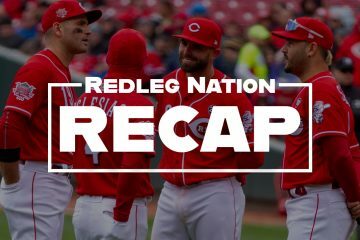 On paper, the Reds could have a shot to scoop up a Wild Card spot, but when does anything work out the way it does on paper? I’m prefacing this piece with that little nugget of unfortunate reality not to be a Debbie Downer or a naysayer but instead to put a simple claim in perspective: The next time the Reds make the postseason, Devin Mesoraco will not be their starting catcher. As much as I love Devin, his hip is shot, his arm is shredded, and for goodness sake the man has to sleep sitting up. When he returns, he will have only played in 39 games since his breakout 2014 campaign. Not exactly a vote of confidence for the Reds 2017 chances. On the bright side (for Devin), it’s not like the Reds have anyone itching to steal his job. Which begs the question, at which step did the organization that produced the greatest catcher of all time go so wrong as to leave the catching situation in such disarray? The Reds need a new guide for cultivating (or scavenging for) premiere backstops. Luckily,Ã‚Â a 21 year-old Internet blogger with no front office experience–i.e. me–has the perfect plan for them. I wrote a few weeks ago aboutÃ‚Â Tucker Barnhart’s hot start and surprising contributions in Mesoraco’s absence. Since then, Tucker’s OPS has dropped over 50 points and his ISO has dropped 40. Tucker hasn’t entirely turned into a pumpkin, but he’s definitely closer to a fall-time vegetable than horse-drawn carriage at this point. Maybe a squash. Besides Tucker,Ã‚Â Ramon Cabrera takes the rest of the catching opportunity, but other than sharingÃ‚Â a name with Ramon Hernandez, which fills the nostalgia quota, Cabrera offers little to the organization. His .605 OPS and and 59 wRC+ land him just a tick past ‘Below Average’ in the ‘Poor’ region of player evaluation. On the whole, Reds catchers have a .636 OPS in 2016, the worst mark since .625 in Devin Mesoraco’s rookie season. Since 1970, only eightÃ‚Â Reds catching corps have had an OPS equal to or worse than the .636 mark. The average catching OPS of Reds playoff teams in that timeframe? 0.759. For those prospect hopefuls, itÃ‚Â isn’t any better on the farm. The Reds top catching prospect is hitting .196/.267/.272 in A ball, and the guy ranked behind him was drafted about three weeks ago. At AAA, there are two 28 year-olds who can’t even crack a .625 OPS.Ã‚Â Corky Miller might just be the most promising prospect in the system, and he’s there as a coach. For the past ten years, the Reds have followed a defense first catching mindset. David Ross, Javier Valentine, Paul Bako, Ryan Hanigan, Ramon Hernandez, Brayan Pena, and Tucker Barnhart are all guys who will give back in glove what they give up in bat. Even top prospect Tyler Stephenson is a glove first guy. The problem with that philosophy is quantifying glove contributions past a simple eye test is pretty much impossible. Just look at Tucker’s DRS and Def numbers for this year: one has him below averageÃ‚Â (-3 DRS), the other decently above average (6.2 Def) despite largely looking at the same variables. Devin Mesoraco was always the exception to this philosophy: the lone Reds catcher who could hit. But with his hip and shoulder problems, it’s iffy as to whether Devin will hit for average, much lessÃ‚Â power. 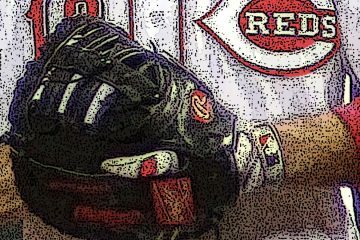 The Reds no longer play in a weak division where they can afford to sacrifice a spot in the lineup to a slick glove. The Cubs and Pirates both have lineups that eschew the bloop and a blast philosophy the Reds love. Their version falls more along the lines of blazing line drive after blazing line drive with a sprinkle of blast for the fans. Targeting bat-first catchers in the draft* and in free agency needs to become the Reds philosophy because they won’t out hit (or really, out pitch) the rest of the Central otherwise. *I discredited Chris Okey, the Reds second-round pick this year, pretty quickly above, but to the organization’s credit, he did hit in college. However, he projects to be a .250 hitter in the pros, which is about what Tucker Barnhart is, so maybe I’ll delay kudos for a bit. 3. Randomly acquire catchers in trades that hopefully will turn their entire career’s around ala Adam Duvall, make an All Star game, and lead the Reds to the playoffs for one miracle run in 2018. Alright, so this step requires a bit of suspended disbelief, but that’s been the front office’s catchphrase for so long that I’m going to co-opt it. Right now, the Reds catching situation boils down to three options. Hope Mesoraco comes back as the Bionic man. Hope Barnhart does the Freaky Friday switch thing with 2014 Evan Gattis. That’s it. For all the talk of the Reds being a promising young team, they sure are putting a lot of faith in the American health system. Acquiring young catchers as throw-ins in the inevitable Jay Bruce trade isn’t as ridiculous as it sounds. Okay, it’s pretty ridiculous, butÃ‚Â such is the way of threeÃ‚Â step success guides. They rarely work how they’re intended. For the moment, the Reds don’t need anything more than Tucker Barnhart. He’s playable, likable, healthy–all a cellar dwelling team can ask for. Tucker is what he is–the worst Reds everyday starting catcher since…well, we had Brayan Pena last year. Tucker is status quo, which has never made a team great. Devin Mesoraco won’t be the catcher that directs a playoff run for this team; that I’m sure of. ButÃ‚Â if not him, then who? It doesn’t seem like anyone knows or is willing to figure it out. As long as Reds fansÃ‚Â focus on the Emerald City of pitching depth, the man behind the curtain tends to fade into the background. What are spin rates? And which Reds pitchers have good ones? So,if not catching…where do we project Devin will play in 2017 and beyond if recovered enough to contribute offensively? The only thing Devin Mesoraco will play again is checkers. And this may just be the Naptown kid in me, but I think the author doesn’t give Tucker enough credit. He has performed well at a major league level (even though he’s sort of slumping) and is our catcher of the future. The Reds don’t need a premier catcher to compete. They need great pitching, a new manager, and for the veterans and young guys to play their best. They all have the potential to win games, but the bullpen and lineup have no consistency, thanks in large part to Bryan Price. When he’s gone, everyone will perform better. I guarantee it. I agree. This post does not take into account Barnhart’s defense and handling of pitchers. The numbers suggest Barnhart isn’t good at either of those things. Nor is he good at pitch framing. If his hip is shot, and his arm is shredded, how does that work for him catching? Not sure I follow your logic. I don’t know how well Mesoraco will recover, but neither does any of us. It’s wise to plan on the basis of a worst-case scenario, certainly, but the fact is that we just don’t know. This just goes to show you that the Reds need a #1 Catcher now. My option would be to load up the prospect truck and send about 3 to Milwaukee for C Jonathon Lucroy. Make Lucroy a central element to the re-build with a 3 year extension. A good defensive C and a good offensive/OBP C.
Lucroy is 30 years old. You want to give up prospects AND sign him to an extension with the hopes that A) the reds will be competitive within 3 years AND B) he will still be an above average MLB catcher? That seems like a rather ridiculous gamble AND would require an overpay to a division rival. He is the best Catcher at pitch framing and throwing out base stealers, to go along with a quality bat. The pitch framing certainly helps out a young staff. Lucroy’s salary is not prohibitive. By the time his extension is over, Okey or Stephenson should be ready. Improvement is needed at the C position and a veteran C who knows how to handle a pitching staff is valuable to a young staff. It might not be an overpay to acquire him. This one trade could make the Reds better at 4 positions, Catcher, LF if Mesoraco moves there with Schebler getting some LH time in LF, 3B if Duvall moves there, and 2B if Suarez is moved there. You’re right in that Lucroy is very good and helps tremendously….right now. . No one could reasonably debate you on that point. What you’re ignoring is what must be given up to acquire him….likely a lot at this point. The Reds don’t have a surplus of anything at this point….so any trade for him would weaken them in other areas. Also, you’re assuming that he would accept the trade here (unlikely) and willingly sign a 3 year extension here, the year before UFA (virtually no chance). You’re looking at this in the vacuum of improving the 2016 Cincinnati Reds and you’re ignoring all of the other elements that go into these things. I don’t see that as better at 4 positions. Duvall is playing excellent defense in left, and it isn’t likely that Mes would be better. Don’t know about Suarez at 2nd, but it’s unlikely that he would be as good as Perazza. There are dozens of reasons why this will never happen….so lets just focus on the easy one. He wants out of Milwaukee because they’re bad, so why would he sign an extension with the Reds? Especially since the Reds would have to give up real assets to acquire him….therfore making them worse in other areas….which likely prolongs the rebuild. He has a limited no trade clause so he maybe able to block a deal anyway….and theres perhaps a 1% chance he’d sign an extension with the Reds. Neither one of you has apparently had a shoulder injury. This is common, and it goes away. I actually tore my labrum in high school as did three other guys on my team (we had a Dusty-esque coach). Absolutely zapped my mobility and two of the other three guys never regained the arm strength to even play high school ball. I had a torn rotator cuff hanging by a thread. MRI did not show this so a simple cleanout went to a repair. A repair that doctor’s order was 9 weeks in a shoulder sling and sleep in a chair. After 5.5 months I was able to go back to work. Mesoraco’s golf swing will be messed up for some time. It’s his left shoulder and barring any set back he should be ok if it was fixed and healed properly. His weight training will totally be different when he gets to that point. I thought Stephenson was known for his bat and the concern was could he stay behind the plate due to size and defense. My understanding is that he is athletic, but really tall for a C. Reports I’ve read were fairly positive about his ability to play C. But I recall the same thing, Stephenson was more known for his bat. I don’t think Mes’ outlook is quite that negative. The hip injury doesn’t bode well for the future, but coming from someone who just had the same operation in December, you can get back to just about perfect in not that long of a time. Now, I’m not a professional athlete, but I am 24 and workout aggressively. 7 months post-op, I’m dealing with zero hindrances to my ability to use the hip running distance, sprinting, squatting, twisting and whatever else the hip can be used for. Mes won’t be catching when he’s 36, but not too many guys do. As for his shredded shoulder, it is his non-throwing arm. I understand that it may affect his power, but it may not. I’m not a doctor, but I don’t see his left shoulder being nearly as impactful on his swing as a knee/quad/hamstring/hip injury would be. And Devin’s first swing this spring did result in a 400+ foot bomb to center. I’m not saying he’s going to save the club. I’m not even sure a healthy Mesoraco moves this team into WC contention. This team has plenty of holes. But I don’t think the outlook is as bleak as he won’t play in the major leagues ever again. Also, as a side-note, Mesoraco didn’t become an offensive prospect until his 4th full minor league season. Stephenson’s offensive debut last year (.273/.356/.371) was more impressive than Mes’s in his first season in 2007 (.219/.310/.270). On top of that, Stephenson hasn’t been exactly healthy for much of this year. The overall negative outlook on the catcher situation isn’t really all that warranted yet. It’s a fair discussion to have absolutely, but there’s reason to be hopeful as well as reasons to not have hope. I don’t think we can expect another 2014. All that we have now is an outlier season. But I don’t think considering him a possible upgrade offensively over what we have had outside of Mes the past few years is out of the question. Good discussion piece! While I think the Reds value defense first in their catchers, and they have stated as much, I don’t remember Javier Valentin, Ramon Hernandez, or Brayan Pena being considered good defensive catchers. I remember Valentin and Pena being brought in as backup catchers who could provide a bat off the bench. Pena specifically came from Detroit after putting up career best offensive numbers if I remember correctly. And Hernandez came over at the end of a long career, and my memory was his defense wasn’t good any more, but his bat was still pretty good. Agree Tony. I never head that Pena was known for defense and I didn’t witness it while he was here either. Same for Hernandez. I can’t even recall Valentin!! Hanigan was my favorite recent catcher precisely because he seemed to call a good game and my understanding was that pitchers really liked throwing to him. Yep. Both Pena and Valentin (the Latin Love Machine) were here not only for backup duties but to be primary pinch hitters. That was the attraction to them being switch hitters. Maybe you can color me crazy, but with a healthy pitching staff and one or two upgrades that could be had without selling the farm, I think we can compete for a post season spot next season. But we have to find out what we have now in Peraza, Barnhart, et al. I tend to agree with Wes that Mesoraco probably won’t be the starting catcher for the next good Reds team, mostly because it’s impossible to predict with any reasonable degree of certainty what Mesoraco will be doing in 2018 period. He could be several years removed from playing in a professional baseball game at that point. The point that I disagree with is that because the NL Central is a strong division, the Reds “can’t afford” to not have good offense at every position. The average OPS for a catcher is below .700 because catching is a defense first position in the way that pitching is a defense first position. No one would say that because the Cubs are good now, the Reds can’t have any pitchers on the team that can’t hit. I hope that the Reds can draft or trade for another good catching prospect, but hitting at a league average rate and being good behind the plate qualifies as good to me. It’s not just giving up offensive production at catcher vs the rest of the division. Its a defense first organizational philosophy that is leading us to have below league average production at multiple postions: C, CF, SS, 2B. The philosophy may be defense first, but the reality is that the Reds are not a good defensive team now, with the exceptions of Hamilton, Cozart, Barnhart and Duvall(small sample size, I know). Really good teams can catch the ball and throw the ball. Developing good pitchers and fielding a team of hackers behind them makes no more sense than ignoring hitting. Mesoraco may not be good again, but it will be because it is very difficult to hit again after pretty much not seeing MLB pitching for 2 years in the prime of a career, regardless of the reason why. His hip is not “shot.” He had a correctable problem, it is should be good to go. I’ve wanted him moved to left field since 2013, primarily because I think he has a very promising power bat but weak defensive tools as a catcher; the Reds would have been better off with his bat in the lineup 145 games in left field, as opposed to 115 games as an injury-prone catcher. (Or, with hindsight, 15 games/year as catcher.) I would still move him to left field; he has a good arm and is faster than most people realize. I’d rather have Barnhart and the generic backup behind the plate. But it will be the layoff, not the lingering effect of the hip and shoulder, that will be the difficult thing for Mesoraco to overcome. I’m guessing Chad Wallach (he of the “prospect” throw-in from the Latos trade) has pretty much shed the prospect label due to his poor performance to date in the Reds’ minor leagues? He’s actually doing decently well at AA so far… walking a ton, basically. He’s one of those long-shot prospects, but he’s still only 24, so you never know. Chad Wallach was indeed having a fine year in AA this season before he got injured in early June. He doesn’t have a ton of playing time because of the injury (115 PA), but when he does play, he gets on base and he can hit for a bit of power (.383 OBP/ .143 ISO). His BABIP is not good (.257) so his .231 average would expect to rebound a bit if his BABIP creeped back up to his career average (.309), but his OPS (.756) is 65 points higher than league average in the Southern League (.691). His wRC+ is 126 and his wOBA is .363, both of which are above average marks. His BB/K is 1.16, and you’re right, he’s walking almost 20% of the time. This is a small sample, but it seems that once he’s healthy, he should very much be considered still a useful prospect. Just thought I’d share this. Didn’t he break his wrist? Kinda hard to judge anything based on that. I was prepared to be dismissive of this article when I started it — catching is not high on the list of concerns — but it ended up being an interesting discussion. I agree with some of the commenters that there is nothing about Mesoraco’s injuries that are necessarily disqualifying. But assuming a guy comes back to the same level of offensive productivity after two of his prime years on the shelf seems like a poor bet no matter what the reason. If the Reds have competent defensive catchers who are not complete offensive black holes (see Barnhart, Tucker) then the question should maybe be where Mesoraco plays most of his time going forward. If he gets his stroke back then he needs to play. And I mean play most of his games somewhere other than catcher because the bat is worth way more than his skills as a catcher (which aren’t bad). If he doesn’t hit as before then its time to move on rather than count on him to go out and not break down playing catcher. This decision is even tougher because it may take a while to evaluate how much of any slow start is due to actual decline due to injury and enforced absence versus rust. Tyler Stephenson won’t be 20 until mid August. He’s had all of 102 PA at A-ball and battled injuries off/on throughout most of that. We often talk about small sample size, but yet gloss over what is essentially about a month’s worth of playing time in A ball that was interrupted by a concussion. He posted a nice slash line in RK ball as an 18 year old, with above average BB% (10.0) and a decent K% (19.2). And while he wasn’t “on fire” his last 52 PA saw him produce a slash line of .250/.308/.354/.662. Obviously we’d like to see that come up, but it’s so much better than the .136/.224/.182/.406 line he put up in the first 50 games. I’ve often read that catchers take longer to develop their offensive games because they have so much to focus on getting to know a pitching staff, defense, controlling the base paths, etc. To me it seems like he was making some adjustments (on top of his extremely low BABIP swinging the opposite way), which is what we want to see out of young guys. Injuries have certainly derailed his season to this point. I think it’s way too early to write of Stephenson. Also, lost in the catching depth in the organization is Jake Turnbull who posted a .291/.395/.373/.768 slash line as a 17-year old with AZL Reds last year in rookie ball. But, to the larger point, yes I believe the Reds need to find an offensive C through trade. Austin Barnes is a guy I’d target in the Dodger’s organization. They have Grandal and Ellis in the Majors, and he’s posting a 114 wRC+ for their AAA team (and posted a 133 wRC+ last season in AAA). He’s MLB ready, bats RH (so some platooning can go on) and seems to be fairly athletic (can play 2B/3B as well). The Dodgers were interested in Jay Bruce. Maybe Barnes could be the 2nd piece in a potential deal. I like our catching tandem until Stephenson and Okey develop. The catching position IS the biggest concern that I see in the next Reds cycle. Moving Mes whether good or bad to LF doesnt solve our catching problems in any way. The answer is wearing a Marlins jersey as we speak. They need pitching and think they can get a wild card this year.We can give them what they want for Realmuto and our catching situation is taken care of for a decade. He is young talented and cheap(atleast for the near future).All criteria’s our FO is demanding right now. Of course we would have to include one of our “stud prospects”. The Marlins also have a terrific backup sitting in AAA and we could include Barnhart in the package and the Marlins would jump on this trade. I agree that regardless of the lasting direct damage to Meso’s hip or shoulder, just being away from playing the game competitively for consecutive years will be a major obstacle for him to overcome on its own, especially as he will be returning at the threshold age for the typical beginning of age related decline. This year in the short time he played, his receiving skills looked terribly rusty; and, he never got going offensively either. Now he will have an added year of rust to work off. They can put him on the 60 day DL and leave him at extended spring training; but, once they advance him to higher competition, the rehab period is limited to 30 days. While it would be extreme, it might not be out of the question that they would ask him to accept option assignment or even an outright assignment if they believe he would clear waivers (who’s going to take on a ~$20M obligation for a guy who has spent the last 2 seasons on the DL) so he can play for several months at minor league levels to get back to speed. I believe T.Stephenson remains the long term option despite his troubled professional start up; but he might take until 2020. Thus it looks like they hope to rush Okey in hopes of pairing him with Banhart from perhaps as early as 2018 until Stephenson is ready. I don’t have your vaunted numbers but my eyes tell me Barnhart is a pretty good catcher. I may be Reds blind but I like him on the defensive side overall. That is to say I am not impressed by any one thing he just has a pretty good look when he has the tools of ignorance on. He is sporadic with his stick but even at that he is IMHO a very good number 2 catcher. IMO Mez is through behind the plate but his ability with the bat and he is fairly young with a favorable contract an AL team will find value in him and maybe be a good chip in a trade. I would agree Carl. I’m not doing sabermetrics on the man but my eyes like what they see. His AB during the 3-run jack yesterday was impressive. He looked silly on a change up in the dirt then barely fouled one off to stay alive before cranking it out. That’s good enough for my catcher. Defensively, he’s money. What is favorable about Mesoraco’s contract? He’s owed about 20 million for the next 2 years. Until he shows that he can stay on the field, he’s completely non tradable ( unless the Reds pick up almost all the contract). He may have the least favorable contract of any player still under team control in baseball. His contract puts the Reds in an awful spot in that they can’t spend anymore money on catchers, yet most of the money allocated towards catching is going into the dumpster. Wes, I’m glad you had the nerve (and the ability) to write what a lot of us have uttered under our breath. The continuing series of unfortunate events surrounding the career of Mes seems to be an issue no one (including management) wants to discuss. The team can be hopeful, but hope does not return value– and they need to get something from that contract before it expires in 2018. I tend to agree with the claim that Mes will not be the catcher when the Reds contend, but I would like to modify that statement slightly. If the Reds are to contend in 2017 or 2018, then they will do it with a healthy Mes behind the plate. I’ll never write off a catching prospect. The Corey Pattersons of this world get a certain period of time to develop. I multiply that number by 10 for prospect catchers. Also, recall that in one fell swoop the Padres acquires Yasmani Grandal from us – a premier prospect at the time. Aside from his PEDs and injuries he has been an above average catcher for Padres/Dodgers. As many have suggested here, not all All-Star catchers are drafted and homegrown. I do agree that the Reds should change plans on Devin. I don’t mind having Tucker behind the plate, though. Especially with this pitching staff, we are going to need someone back there who can handle pitchers well. As long as Tucker can do that job, I will take a lower level batter for that job. Now, as soon as those young pitchers “get developed”, then I could see letting Tucker go for a better hitting catcher. But, until then, whether it’s Tucker or someone else, I want a catcher who can handle pitchers well. The problem with drafting offense first catchers is that they very, very rarely can be even near adequate behind the plate. Mike Piazza is the best that comes to mind and there are very few that aren’t him that I’d want. Gatti? Um, no thanks. I want a catcher that can play catcher. 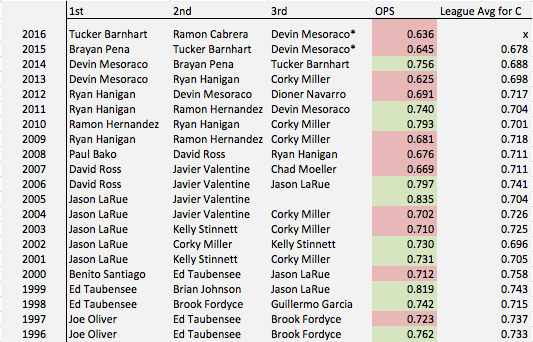 Assuming Mesoraco is done and I’m not convinced he is, and Barnhart will never hit, then the Reds need to do what the Pirates did. They need to look into a guy that may be undervalued and grab him. The Pirates hit a HR with Carveli. Gattis, not Gatti. I hate my phone. And Russell Martin before that.